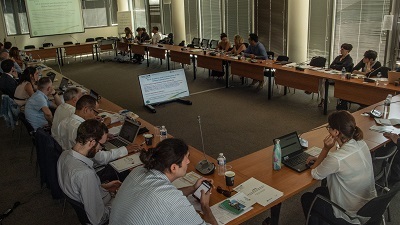 SHERPA partners met in Marseille on 17-18 July 2018, during the project’s 4th steering committee, to take stock of the testing activities and prepare for the transferring and capitalising phases. The CPMR’s Intermediterranean Commission (IMC) organised SHERPA’s 4th steering committee in Marseille, at the premises of the Région Sud Provence-Alpes-Côte d’Azur. The event was interspersed with two side meetings i.e. a meeting of the (IMC Task Force on energy renovation in Mediterranean buildings as well as SHERPA’s Joint Transferring Seminar. These meetings provided the opportunity for partners to draw conclusions from the activities of the testing working groups, meet with regional and local authorities interested in replicating the project’s methodology and getting involved in transferring and capitalising activities, and to open up the discussion on regional strategies at Mediterranean level in terms of concrete joint actions for energy efficiency in Mediterranean buildings. As discussed internally during the steering committee, and as presented to observers during the side meetings, the work carried out in the 100 regional buildings selected for the project’s testing phase is almost ended. All buildings have completed the first two steps of the testing phase, which consist in identifying and characterising each building, as well as carrying out energy diagnoses and benchmarking analyses. The remaining two steps – i.e. identification of energy efficiency measures and calculation of related cost and energy savings, and financing analysis to find best financing operative schemes – are well under way and should be completed by the end of September. 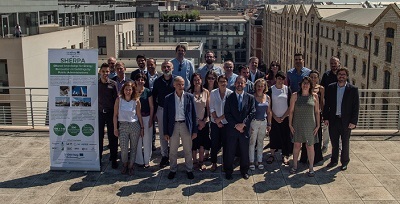 The meeting of the CPMR Intermediterranean Commission’s (IMC) Task Force on energy renovation in Mediterranean buildings brought together representatives from many regional authorities i.e. regions Lazio, Abruzzo, Emilia-Romagna, Calabria, Catalonia, Valencia, Provence-Alpes-Côte d’Azur, Occitanie, Crete, Western Greece, Gozo; as well as two Tunisian municipalities, i.e. Carthage and Sidi Bou Said. These two municipalities were represented by their mayors, respectively Ms Hayet Bayoudh and Mr Mohamed Cherif. This meeting aimed to raise awareness on the project among IMC member regions and SHERPA observers, and start discussing and defining the concept of SHERPA’s Joint Action Plan due to be produced by August 2019 during the capitalising phase. On this occasion, Davide Strangis, Executive Secretary of the IMC, presented the model of the Bologna Charter and related Joint Action Plan, which SHERPA aims to partially reproduce, relatively speaking. The steering committee was also interspersed with SHERPA’s Joint Transferring seminar (JTS), aimed at coordinating the transference of SHERPA’s pilot experimentation. In the first part of the meeting, SHERPA’s 4 working groups coordinators presented the current state of the testing phase and discussed the main messages to be transferred and how to share the conclusions to the other regions and municipalities within the MED area. The second focused on the organisation of the upcoming National Transference Seminars, aiming to attract and engage other Mediterranean Regions and municipalities in the project. It is to note that SHERPA is progressively reaching a critical mass of people interested in its activities. To date, SHERPA has 94 observers from different countries (Spain, Italy, France, Greece, Croatia, Malta, Tunisia and Morocco). This number is expected to increase, especially thanks to the national transference seminars. 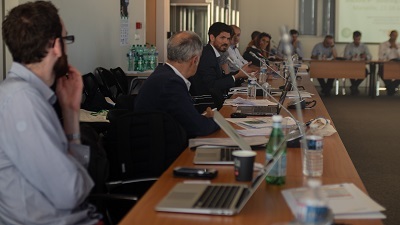 Finally, participants had the chance to visit the headquarters of the Conseil de territoire du pays d’Aubagne et de l’Étoile of the Aix Marseille Provence Metropolis in which very advanced energy renovation measures were implemented. For further information, please contact Emmanuel MANISCALCO (emmanuel.maniscalco@crpm.org) or Flora LEROY (flora.leroy@crpm.org).